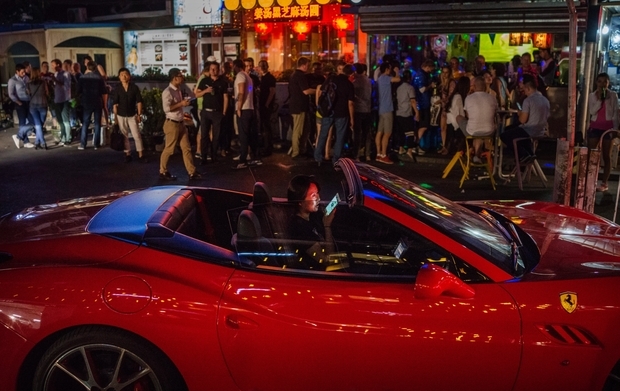 A woman talks on a mobile phone while driving a Ferrari through a Beijing bar district, May 30, 2015. Before the stock market downturn, analysts expected China to become the world’s largest luxury car market by 2016. By Liang Jing. This article was originally published in Chinese by Radio Free Asia. China’s economic outlook once again became the focus of attention for many last week. For one thing, the Economist Intelligence Unit (EIU) listed the possibility of a hard landing for China’s economy as the topmost of the world’s top 10 risks. There was, nevertheless, no apparent reaction in U.S. or China stock markets, whose prices rose as expected, in stark contrast to their reaction to bad news from the Chinese economy earlier this year. In other words, while investors’ outlooks for the Chinese economy are not optimistic, they are not so pessimistic—at least not as panicky as it was some time ago. Does this mean the EIU’s warning about a possible hard landing of China’s economy was a bit exaggerated? Not having seen their research report, I don’t know how they defined “hard landing.” Going, however, by official Chinese understanding of economic hard landings in the past—when the economic growth rate is far below 8 percent or the adjusted figure of 6 percent—it has already occurred or is occurring. Virtually no experts, Chinese or foreign, now really believe the official economic growth rate figures. But few care publicly to pierce the veil. On the one hand, they want to save face for the officials; on the other, no one, not even the officials themselves, can give a clear idea of what China’s GDP actually is. This being the case, the substantive issue people really care about is whether the economy will totally collapse, entailing comprehensive social unrest and political crisis. At present, the mainstream judges that it will not. Does this judgment have solid grounds? I think so, although my grounds and those stated by Chinese officials are not the same. The officials claim the main reason is that the government not only has the ability to control the growth of debt, but can do so and reform as well, maintaining relatively rapid growth. But many processes now in train indicate the economic situation is still deteriorating; China’s economic policymakers have yet to find a way out of the woods. The recent vicious hike of housing prices in first-tier cities, and mass protests by coal mine workers in Heilongjiang, are proof. In fact, what best displayed the grimness of the economic situation was when Xi Jinping, receiving criticism from all sides, was forced to make major adjustments. Were he as optimistic about the economy as his officials claim to be, one can readily imagine that he would not likely have made such a switch. So, why can China’s economy not easily deteriorate to the point of fully collapsing? I think the most fundamental reason is that times have changed; the interdependence of human beings, especially between great powers, has developed to an unprecedented degree; and, from their own and global interests, the U.S.-led developed countries not only don’t want China to collapse economically, but have considerable ability to coordinate economic policy-making with China. Wen Jiabao’s 4 trillion stimulus policy decision of 2008 has been criticized. But Wen had no regrets: he had U.S. support for a decision that may in fact have saved the U.S. economy—that is to say, saved capitalism. Absent such historic external factors, the possibility of U.S. and above all Chinese authorities playing dog-in-the-manger would greatly increase. This basic fact is one that few in China are able or willing to grasp. One reason is their ignorance of a truth emphasized by Obama: Americans are naturally less than overjoyed to see a China stronger than they are, but are even less happy to see a chaotic China. Imagine if China become another Syria—what would that do to the world? In this overall trend, some people argue that Latin Americanization is China’s likeliest prospect. There is surely a grain of truth in this, but China and Latin America differ greatly in terms both of population and economies of scale, or of cultural traditions. I am therefore more inclined to believe not only that China's economic downturn will continue for quite a period of time: it will stall economic development in the U.S. and other developed countries as well. It is ever clearer to us that China’s economy has profoundly affected U.S. policy options, and no one has a completely independent monetary policy today. Downturn or slow economic growth like this implies, of course, a variety of crises and turmoil taking place. But for the same reason, an economy that is crisis-ridden and that is hard to get rich quick in& will lead political and intellectual elites of other states to abandon impetuousness and, rethinking their outdated ideologies and doctrines, imagine and build a new world order.